In October of 2016, nearly 170 community leaders from agencies and organizations within the Buhl region participated in a first-of-its-kind Community Forum held in Sharon, PA. The attendees of the Forum contributed the suggestion that the Buhl Regional Health Foundation (BRHF) should create and provide a service directory for our community. 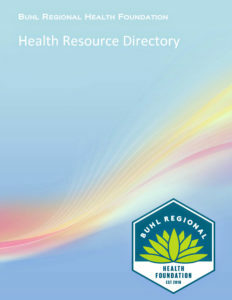 Buhl Regional Health Foundation’s “Health Resource Directory,” in alignment with the Foundation’s mission, is a tool and resource to promote connections, partnerships, and collaborations within our community’s health network to identify and address the diverse health care needs of the greater Sharon regional area. The primary service area for the BRHF includes Clark, Farrell, Greenville, Mercer, Hermitage, Sharon, Sharpsville, Transfer, West Middlesex, and Wheatland in Pennsylvania and Brookfield, Hubbard, and Masury in Ohio. The secondary service area consists of parts of Eastern Ohio, Northern/Eastern Mercer County, and Northern Lawrence County. The contact information listed in this community directory was gathered through follow-up correspondence directed to attendees and interested parties following the Forum.